Compatibility: metal watch band strap replacement fit for any cases with standard lug ends such as Longines, IWC, SchaffHausen, Rolex, Citizen, Sekonda, Stuhrling, Breitling ,Hamilton, Seiko, Catier, Omega, Swatch, Mido, Rado, TAG Heuer,T.F.Bucherer, Titoni, Timex, Invicta, bulova, wenger, tw, rotary, Kreisler, pulsar,relic, esq,casio,sport watches, smartwatches, etc. 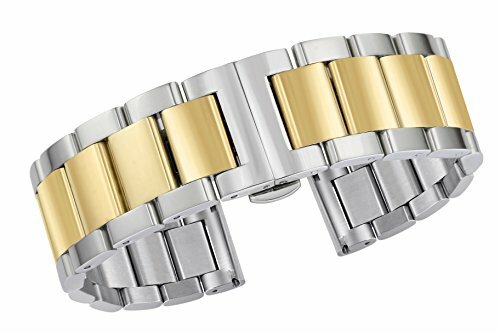 The two tone silver and gold metal watch band comes with straight end. At the length of 180mm, it can be adjusted by removing the links. This heavy type band has a thickness of 4.2mm. For the clasp there are two push buttons forming a quick snap in and release style, which when worn makes the butterfly clasp neatly disappears from view. Great care has been taken in the finishing of the watch strap. Made of quality 316L stainless steel, our popular watch straps create a fascinating lustre and glossy surface to provide you a pleasing wearing experience. With solid links it is tough and corrosion resistant. The semi-matte wristbands are polished and grinded with the utmost care during the entire manufacturing process. We also use the best PVD coating technology to ensure the long lasting of the color. These time-intensive production processes guarantee the highest possible wearing comfort and the long durability and joy of our products. The watch band is compatible with most watch brands with standard lug end such as Tissot, Longines, Wenger, IWC, Rolex, Mido, Omega, Cartier, Tudor, Movado, Rado, Hamilton, Titoni, Certina, Swiss Military, MontBlanc, Armani, Jaeger, Invicta, Zenith, Orgival, Ranceas, Timex, tw, rotary, Kreisler,etc. We offer a wide range of straps with a variety of sizes and colors to meet your watch needs. (size: 15mm, 16mm, 17mm, 18mm, 19mm, 20mm, 21mm, 22mm, 23mm, 24mm, color: black, silver, gold, rose gold, dual tone silver and black, dual tone silver and gold, dual tone silver and rose gold). All of our stainless steel watch bands are resistant to water, sweat, torsion, UV exposure, and rubbing, but it is recommended to wash them with hot water and tooth paste once a month.